Home/Our Products/What is a Bubble Tube? A bubble tube is a sensory piece of equipment used to provide a relaxing, colourful and joyful experience. First conceived by Ad Verheul and Jan Hulsegg in Holland in 1974 as they were creating ‘snoezelens’ (Sensory Rooms). A bubble tube uses different coloured led lights that can be controlled by an interactive controller to determine your perfect relaxation point. There are many ways in which our technology can control your bubble tube anything from being touch sensitive to using your voice to change the colour! 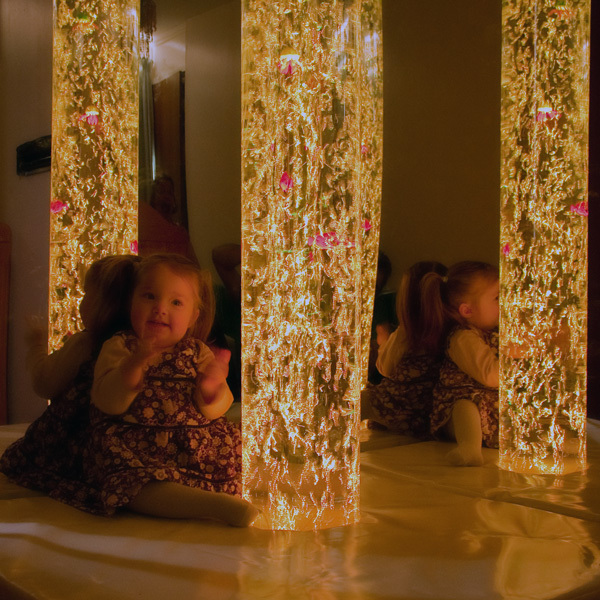 People with autism can focus their attention and interact with the eye catching bubble tube. 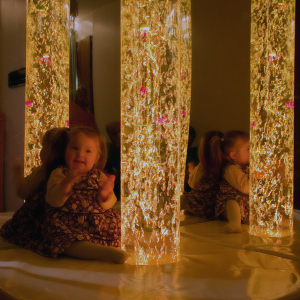 This provides a very relaxed environment for them, the beautiful colours highlight the marvelous bubbles that feature as a centerpiece in any sensory room. The bubble tube is perfect for educating children, they can learn about different colours and recognise certain feelings they get when seeing, for example, a blue colour to mean cold. Let’s not forget they can be used to showcase products in retail and for any other interactive exhibitions just check out our recent project that was finished in the new CBeebies Land at Alton Towers Resort. If you use a bubble tube we would love to see it and how you use it, just tweet us your photos to our Twitter page.